Be your own Mother of Dragons or Father of Dragons. 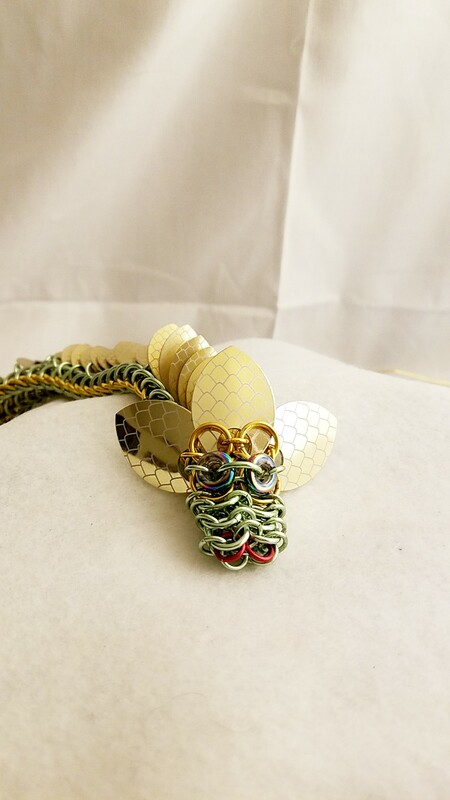 This Mythical Dragon Sculpture is hand made ring by ring so you can have your own dragon baby. They are made in two sizes 12-inch and 24-inch dragon this is from tip to tip. You can customize your dragon in a number of ways. Customize your Dragon Your way. Etched wings look better however you can have them plain. 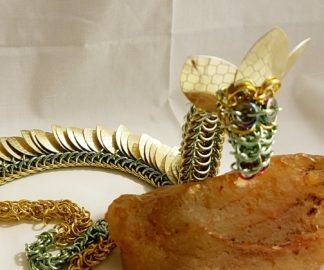 These Etched wings only come in a few colors, but I can make them match your dragon well. 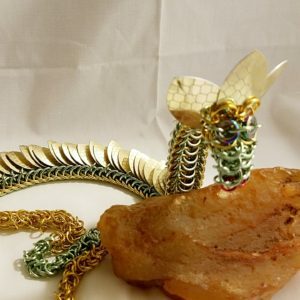 These colors are able to be chosen at ordering a picture of 2 of them is below in the gallery are what the etched wing scales look like a mirror silver and a green. There are 7 different etched wing colors to choose from however if you decide not to have your wings etched they can match your dragon with plain scales with 11 different large scale colors, however, sometimes other large scales can be ordered if available to match your dragons back scales. 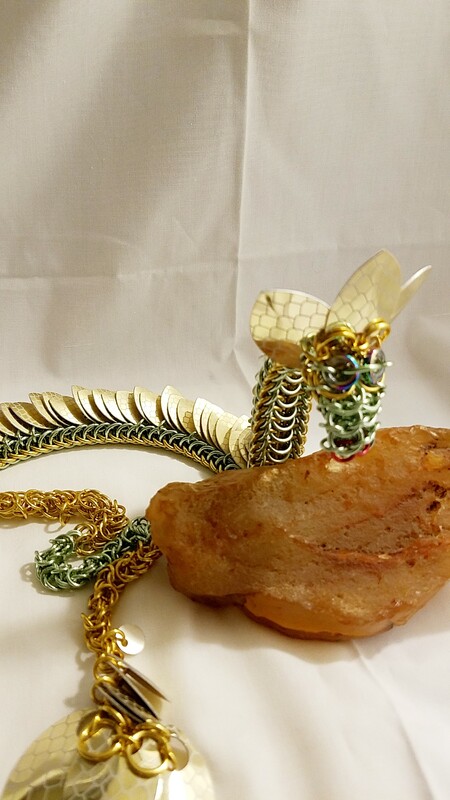 Wings are available in 5-inches or our normal 3 scale size, your choice. 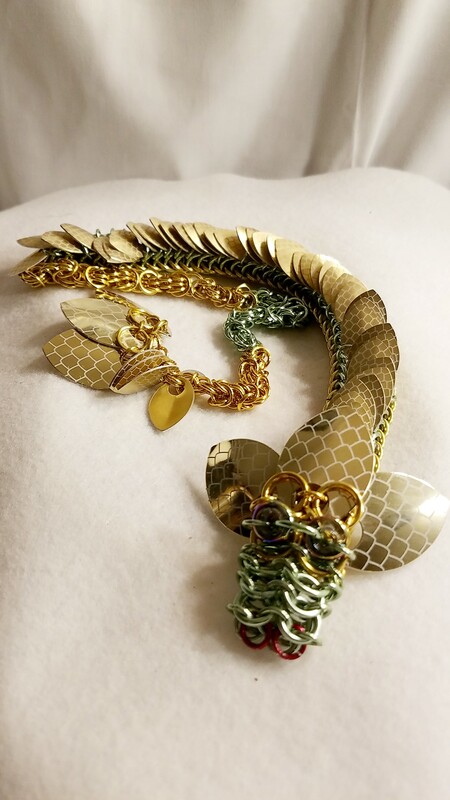 Scales for the back, head fringe, and tail can be etched or plain. Etched scales give a more realistic effect they can be staggered with plain ones or only plain ones can be used. 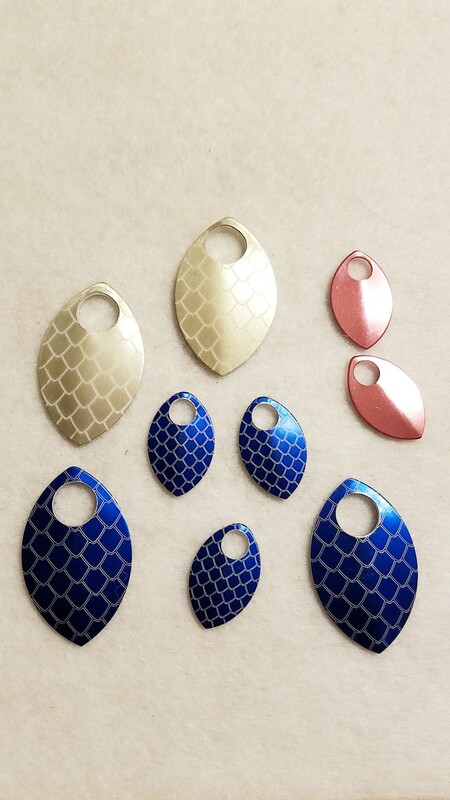 Shown are the Champagne and Blue etched scales Large are for head and tail and the small is used for the back (picture in the gallery below). Also shown are plain pink scales, that can be used on the back. These are not the only colors that can be used for the scales. Etched come in a wide variety of colors. 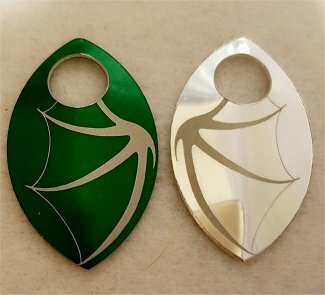 The etched scales come in up to 13 different colors that can be used. and even more with the plain small scales. Dragons are originally made without their wings or a stand unless specifically ordered that way. The stand is made to help your Dragon stand up so it can show off its wings however some have other ways of doing that themselves. The stand is made of wood and painted to look like a stone stairway .. it has some Moss attached to it and a couple of small brads as well so that you can place your dragon on the stand so that it doesn't slither away. 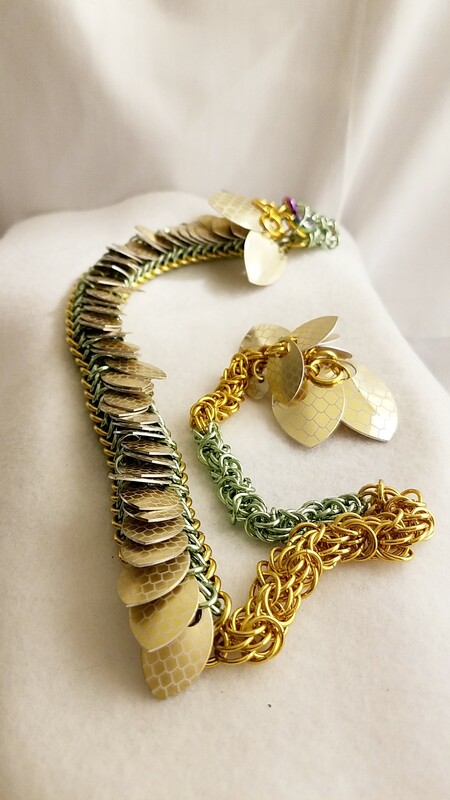 Your dragon will look as if it is on a mossy mountain winding staircase or similar too. (see pictures below). Dragons are typically hatched to order. However, I do sometimes have one or two in the stable. These will be listed on Facebook and sometimes I will be able to notate them here. 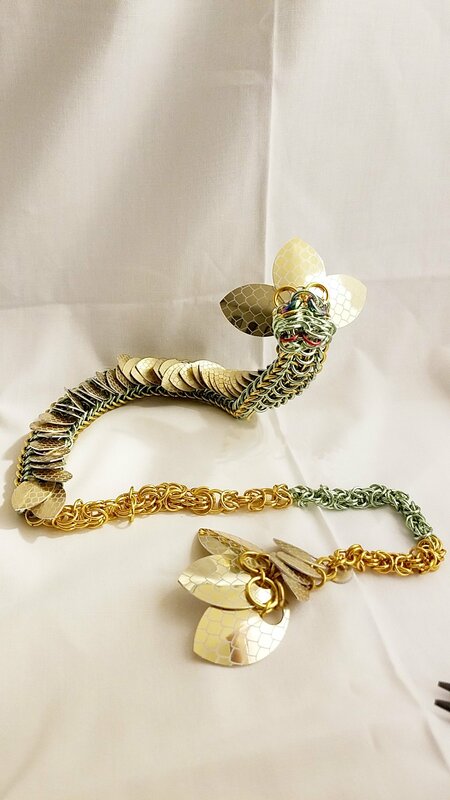 A Dragon Sculpture is made with Anodized Aluminum Rings and Scales. What is anodized aluminum? The aluminum alloy used is 95% aluminum and 5% magnesium; this creates a ring that is approx. 2/3rds the strength of steel but 1/3rd the weight. Anodizing is a process that adds a hard finish to the ring that gives it its color. 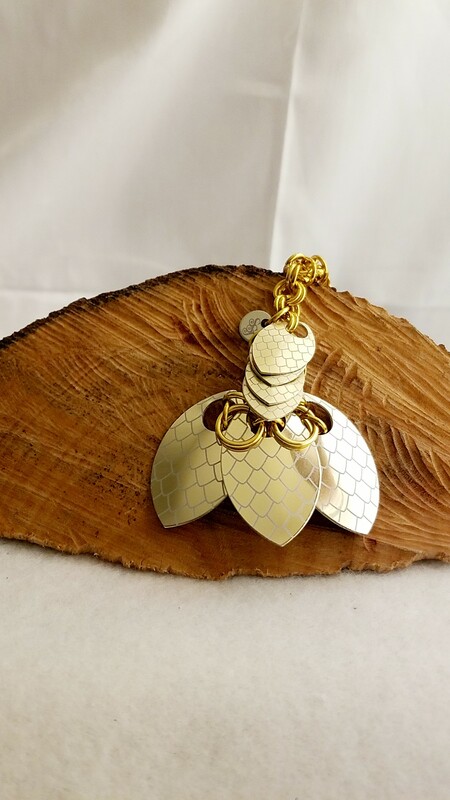 The finish is corrosion resistant and can stand up to most damage without flaking, cutting or grinding on the ring with another hard metal surface (grooved pliers, scissors, etc...) and acids like chlorine will cause damage. Combined this means you have rings that are light, strong and resistant to most forms of common wear and tear. Cleaning should be handled with water and nonacidic soap. The stand is made from natural wood, painted with textured paint and some decorative moss attached too it. 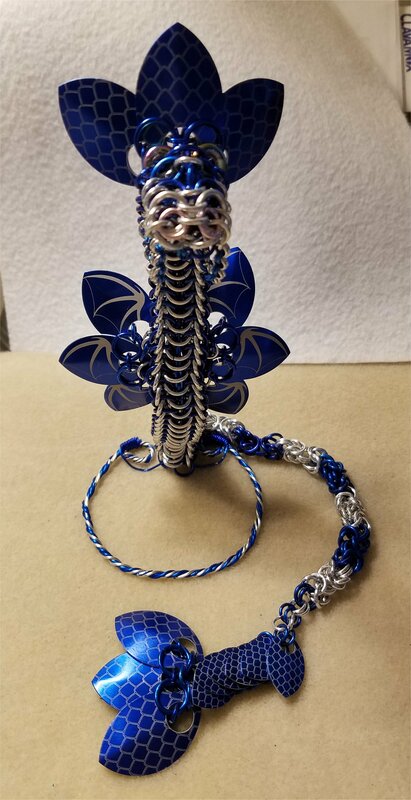 If you would like to know more about the gemstones, rings, and items that are used in making handmade items like this, Mystical Dragon Sculpture; please look at the Material Description Page and my Chain Maille Descriptions page. Note: If you have one of those dangit moments and wish you should have purchased the stand anyway, (don't we all get it at one point or another), and want to buy the stand later I will have it for sale separately.